Sir John A. MacDonald (Jan., 1815 - 6 June 1891) - A gentleman from Kingston, Ontario (probably arranged by The Hon. 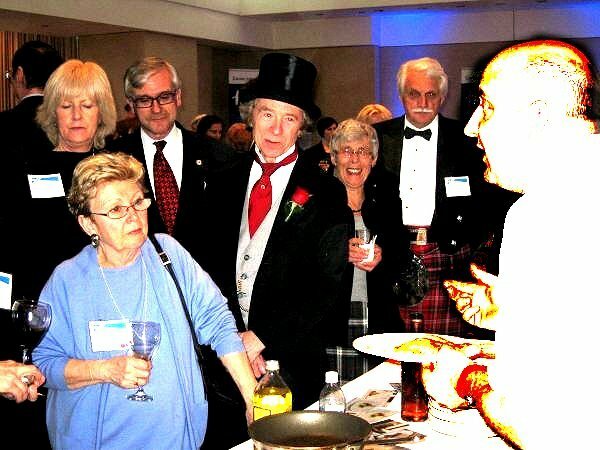 Flora MacDonald, recipient of the Scot-of-the-year-Award in 2009) attended the event dressed as Canada's first Prime Minister (1867-1873) and he appears in this photo with Chef Tom Lewis, who was visiting Canada during Scotland Week 2009 from Monachyle Mhor Hotel within Loch Lomand and Trossachs National Park. The Scottish-born Right Honourable Sir John A. MacDonald, GCB, GCMG PC (UK) PC (Can. ), QC, immigrated with his family as a boy to Kingston in the colony of Upper Canada. He became a prominent lawyer in Kingston, where he was elected to the legislature of the United Province of Canada. By 1857 he had become premier of an unstable system. Joined by his rival, George Brown, the parties united to seek federation and political reform, resulting in the British North America Act and the birth of Canada as a nation on 1 July 1867. He saw the Canadian Pacific Railway through to completion in 1885, which helped to unify the remaining northern half of North America in Canada.